On Election Day, eleven Michigan cities will consider legalizing small amounts of marijuana. That’s the largest number of municipalities to consider the question in a single election in Michigan. Safer Michigan Coalition Executive Director Chuck Ream is leading the effort to legalize small amounts of cannabis in eleven Michigan communities. Voters in Oak Park and Hazel Park already approved ballot measures in August. Questions will not appear on ballots in East Lansing, Utica, Portage, or Benzie County - despite what the shirt says. 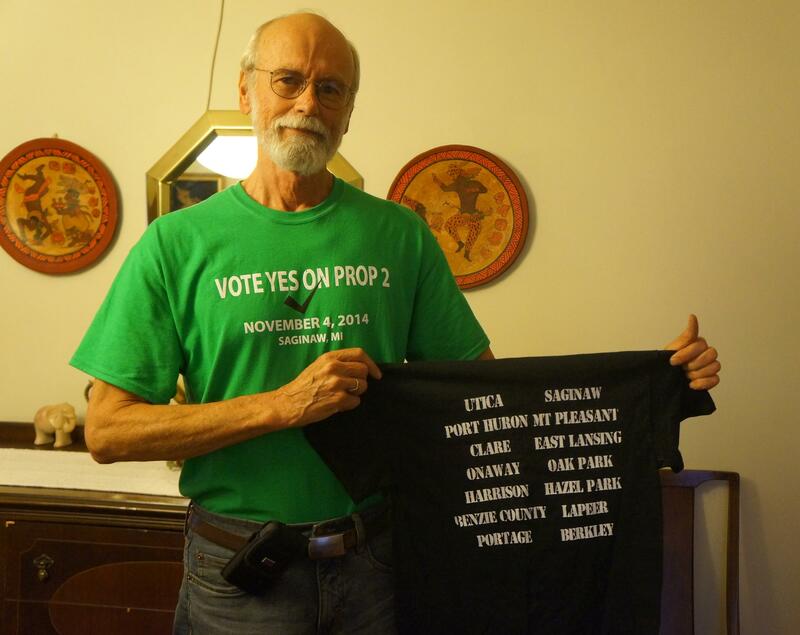 Chuck Ream is the guy working to bring a pro-marijuana law to a city near you. He directs the Safer Michigan Coalition, which is organizing all of these local ballot campaigns. He expects this to be a banner year for the proposals despite not being able to actively promote them. The measures would make it legal for someone over the age of 21 to possess up to an ounce of marijuana on private property. Communities that will consider the question on November 4th range from urban centers to rural communities and upper-middle-class suburbs. The eleven cities are Saginaw, Mount Pleasant, Clare, Harrison, Frankfurt, Onaway, Port Huron, Lapeer, Berkley, Huntington Woods, and Pleasant Ridge. Alex Hale of Berkley says he plans to vote in favor of the proposal. He says cities are spending too much time and money enforcing ineffective anti-marijuana laws. Despite growing public sentiment in favor of relaxing marijuana laws, most law enforcement groups are pushing hard against the proposals. “I think it’s economically and emotionally driven, which are two really bad reasons to be making decisions on anything dealing with public safety issues,” said Terry Jungel, executive director of the Michigan Sheriffs’ Association. Jungel believes the ordinances would lead to more people using marijuana. He says that would result in more illegal activity like driving while intoxicated, which he claims would actually cost taxpayers more. And Jungel points out it would still be illegal under state and federal law. “I would submit that passing a local ordinance serves only to make a local unit of government a co-conspirator in a federal crime,” he said. How much would really change? More than a dozen other Michigan cities have already passed marijuana decriminalization or legalization measures in recent years. Hazel Park legalized small amounts of cannabis in the August primary. 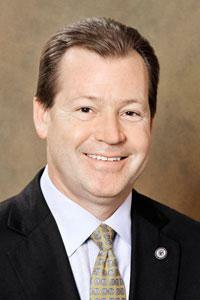 City Manager Edward Klobucher says not much has changed, and he doesn’t expect it to. He says he does not think that is the point of these local ballot initiatives anyway. “I think that these ballot initiatives are primary motivated by activists that want to send a message to our state and federal policymakers that it’s time to act on legalization of marijuana,” he said. If the local ballot measures do well, some pro-marijuana activists say the next logical step is to put marijuana legalization on the statewide ballot in 2016. But Chuck Ream with the Safer Michigan Coalition is not so sure. Despite the lack of funds, pro-marijuana groups have a reason to be optimistic. They have put 16 measures on local ballots in recent years – and they haven’t lost a vote once. The top lawmaker in the state Senate says he’s now on board with legislation to allow medical marijuana dispensaries in Michigan. Senate Majority Leader Randy Richardville, R-Monroe, is now also embracing a bill that would allow state-certified patients to use edible and other non-smokable forms of marijuana. 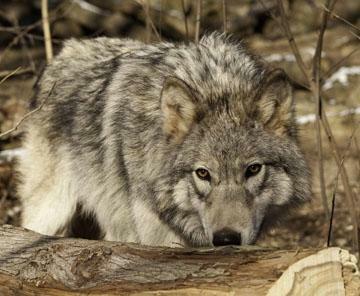 Michigan voters will get to weigh in on two laws that allowed wolf hunting in the Upper Peninsula. The Humane Society just started airing ads aimed at persuading voters in the closing days of the campaign season. But whether people vote “yes” or “no” on wolf hunting, the two ballot questions are not the final word on the issue. That’s because the ballot campaign on its own will not determine the future of wolf hunting in Michigan. Interlochen Public Radio is co-sponsoring a number of debates over the next week for candidates in Northwest Lower Michigan seeking state and federal office. Candidates for the 101st and 104th State House districts, the 35th and 37th State Senate districts, and Michigan's 1st Congressional District will participate. For information about attending the live events, follow the links below. You can listen online (on this page) within 24 hours and they will also be broadcast at the times indicated on IPR News Radio. The race for northern Michigan’s U.S. House seat was one of the most closely contested elections in the state in 2012. 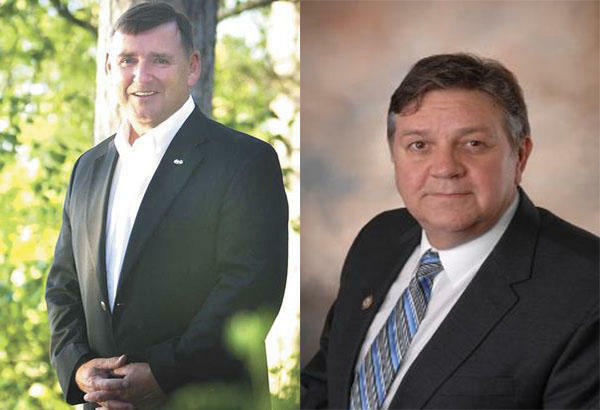 Republican Dan Benishek won reelection by less than half a percentage point. Once again he's facing strong competition as the November election approaches – this time from a retired Army National Guard general.